A wildlife biologist crew leader has several crews, each consisting of two biologists. The crews camped and worked in the woods and he made his rounds to visit each pair every few days. One particular crew, Sarah and Jim, were not getting nearly as much work accomplished as the others, so he suspected that they might be up to some funny business. The following day, he paid them a visit. "Is anything funny going on here"? "What do you mean by that?" the pair asked back. "I mean, you're not getting much fieldwork done. Are you two, you know, maybe doing something you're not supposed to do?" "Absolutely not!" the Jim replied.
" We are strictly co-workers" "Oh yes," the Sarah replied, " We hike all day, record our data, return back, and fall asleep exhausted. "That's right!" Jim replied, "and me in my tent, and she in hers!" The crew supervisor spent the remainder of the day in th e field with the pair. He left the field early, returned to camp, retrieved his Jeep and left the area. 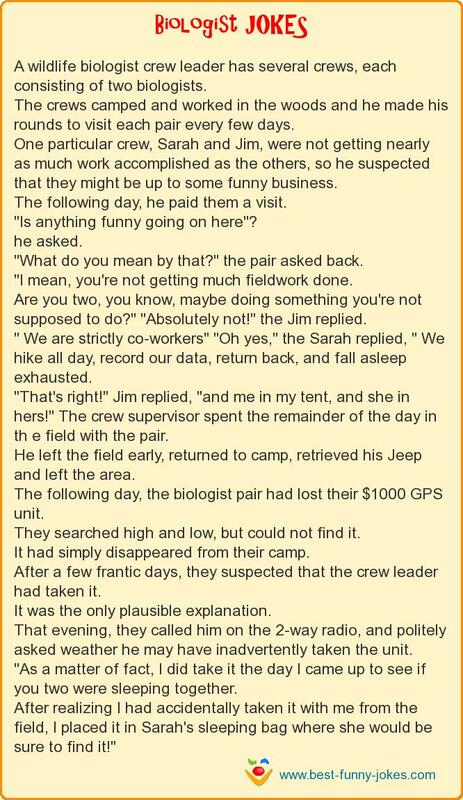 The following day, the biologist pair had lost their $1000 GPS unit. They searched high and low, but could not find it. It had simply disappeared from their camp. After a few frantic days, they suspected that the crew leader had taken it. It was the only plausible explanation. That evening, they called him on the 2-way radio, and politely asked weather he may have inadvertently taken the unit. "As a matter of fact, I did take it the day I came up to see if you two were sleeping together. After realizing I had accidentally taken it with me from the field, I placed it in Sarah's sleeping bag where she would be sure to find it!"